Professor Saso Ivanovski graduated with BDSc (Honours) from the University of Queensland Dental School in 1993. He subsequently completed a BDentSt research degree in 1995, following which he was awarded a National Health and Medical Research (NH&MRC) postgraduate scholarship and commenced a PhD which was completed in 2000. This was followed by specialist training leading to the award of an MDSc in Periodontology in 2002. During his studies, Saso worked in private practice, initially as a dentist (1994-2002), and subsequently as a specialist periodontist. Saso was a NH&MRC postdoctoral fellow and a senior Lecturer at the University of Queensland from 2003 to 2006. During this period, he was awarded a fellowship by the International Team for Implantology (ITI) and spent a year as a clinical research fellow at the Eastman Dental Institute in London. Upon his return from London in late 2004, Saso joined Dr Ken Nixon’s practice and Brisbane City Periodontics and Implants was formally established in 2006. In 2006, Saso was appointed the inaugural Chair and Professor of Periodontology at the Griffith University School of Dentistry and Oral Health where he leads the specialist training program in periodontology. He is currently Deputy Head of School Research and leads the Regenerative Medicine Centre at Griffith Health Institute. He currently combines this position with his specialist periodontics practice at Brisbane City Periodontics and Implants. 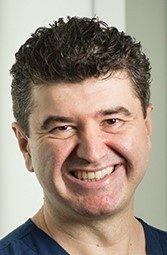 Saso is a fellow of the ITI, a member of the Dental Board of Queensland, the past federal president of the Australasian Osseointegration Society (AOS), and current federal president of the Australian Society of Periodontology (ASP). Saso has published over 70 articles in the peer-reviewed international literature, has lectured extensively nationally and internationally and has been the recipient of numerous research grants and awards. He leads an internationally recognised research group with an interest in clinical implantology and periodontology, as well as the cellular and molecular aspects of osseointegration and periodontal regeneration.